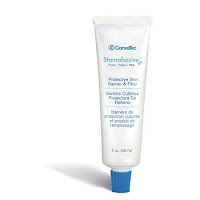 Stomahesive paste by ConvaTec is a very common ostomy accessory. It is an excellent item to use despite what kind of ostomy you have because it will help ensure a good fit as well as protect the skin around your stoma. You can apply Stomahesive Paste to the skin or skin barrier. Application of Stomahesive Paste to a skin barrier or wafer is easy. It does not matter if the wafer is pre-cut or cut-to-fit. After preparing the wafer for use, apply a small line of paste on the back of the skin barrier around the opening on the adhesive side of the barrier. Don't spread the paste and don't apply it to the outer rim of the barrier. Then center the skin barrier/wafer over the stoma and gently apply pressure over the barrier to ensure a good seal. The pressure will distribute the Stomahesive paste under the skin barrier as well as rise around the stoma creating a great seal.